First Place Winners: Sandy Bobulis, and from left Dr. Ed Talusan, Mike Bobulis, and Tom Sampson. Sandy also won for the longest drive for women. 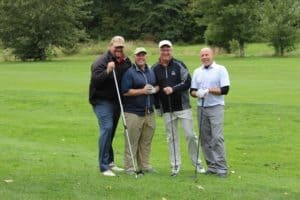 The 20th Annual Lions Club Charity Golf Tournament took place on Monday September 24th 2018 at Easton Country Club. It provided fun for all while raising substantial funds for local charities, Lions scholarships, and eye research. The first place went to the team of Mike Bobulis, Sandy Bobulis, Eduardo Talusan, and Tom Sampson. Sandy Bobulis had the longest drive for women, and Mike Bobulis became the first person in tournament history to get a hole-in-one. The longest drive champion for the men was John Quattrucci. The closet to the pin winners were Diane Shannon and Bob Sheridan. The financial success of the tournament depends on full community support. Once again the North Easton Savings Bank was the tournament’s primary sponsor. 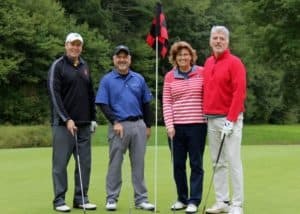 Many businesses and individuals sponsored holes including the, Bank of Easton, RBC Wealth Management, Dedham Savings Bank, Maver Memorials, Fernandes Lumber, Mansfield Bank, Isobel Williams @ Keller Williams, Conley & Wood, Jeanne & Carl LaCivita, Cesar’s Hole, Dale Kerester, Collisions Doctors Inc., Dr. David Mudd, Rick Glynn, Megan Ferguson @ Keller Williams, Taylor Insurance, The UPS Store of North Easton, Lenny Alteri/ Premier Properties, W. J. Poliseno Plumbing, Springhetti Masonry, Vareika Construction, Connolly Insurance, Easton Funeral Home, Morse Insurance, Thermal Fluids, Lion Nancy Sullivan, Lion Bill Ames, McMenamy Realty Group, Center Insurance, Weichert Realtors/Briarwood, Collision Doctors, Inc., Easton Real Estate/Bob Cunha, Easton Insurance Agency, the Law Office of Sutton and Sutton, John Gunning Commonwealth Finance, Hometown Auto Shop, and Ultimate Pizza. After the tournament the players enjoyed a fine luncheon provided by Easton Country Club while participating in a silent auction. Donations for the auction table came from The History Room, Easton YMCA, Lion Lynn Kingsbury, Hilliard’s Chocolates, Giorgio’s Hair Salon, Hennessey’s Liquors, Starlight Room Dinner Theater, Paperback Junction, Pop’s Liquors, Marilyn Henderson, The Pool Place, Roche Brothers, and the Preservation Society of Newport. 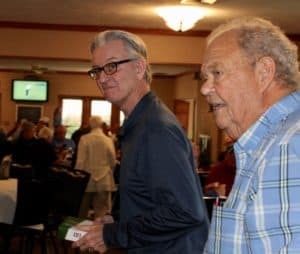 Generous donations to the auction also came from many restaurants: The Beanery, Bertuccis Restaurant, Corfinio Restaurant, Doyle’s Rub and Grill, Leandros Italian Restaurant, Maguires Restaurant, and McMenamy’s Seafood Restaurant. 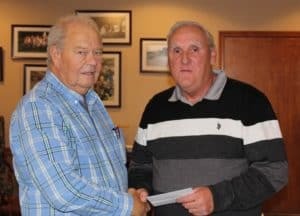 In addition, the following people and organizations donated to a special art raffle: Carolyn Cole, Jeanne Ebert, Eveline Johnson, Easton Lions Club Thrift Store, and Easton Grange #196. 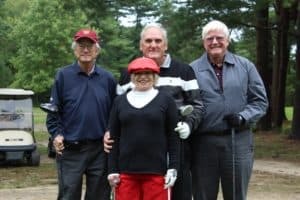 Long Drive Champion John Quattrucci (second from left) with teammates Steve Hoffman, Lori Maver, and Dale Kerester. 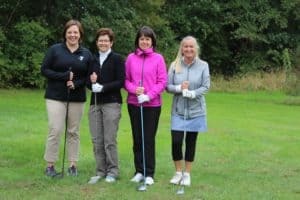 Woman’s Closest to the Pin winner Diane Shannon is second from the left with teammates Serah Selmon, Nancy Antonucci, and Marilyn Cyr.